Which review you want next? Eilish first started music by performing covers for her hometown with her brother, Finneas O'Connell (better known as FINNEAS). She later released some of her first songs in 2016 such as "Six Feet Under" & "Ocean Eyes" on SoundCloud. Months later, she would drop her debut project, "don't smile at me", with a feature from Vince Staples. 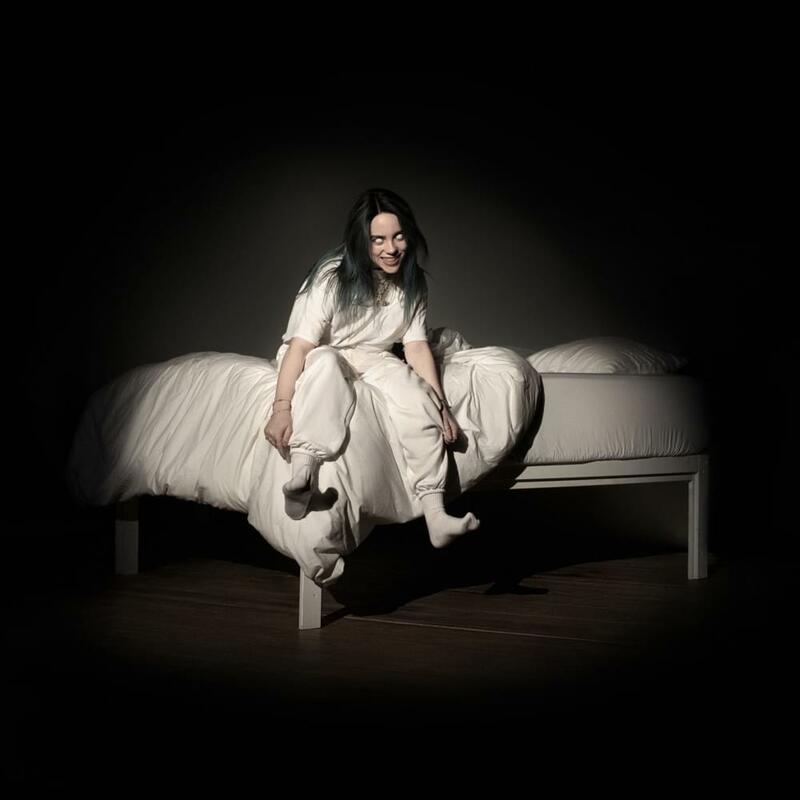 Her debut album, "WHEN WE ALL FALL ASLEEP, WHERE DO WE GO? ", is slated to release in March. "bury a friend" was first teased by Eilish on her YouTube channel with a video snippet titled "hahahaha". The snippet features a slightly different intro and a more "behind-the-scenes" look at the music video. She then revealed that the track would come out January 30th and be the first single from her debut album. During my first listen of this track, I thought of horror. It was a thrill ride through a horror movie, there's no other way to describe it. She describes it herself as a song that was "written from the perspective of a monster under my bed". It's like a storytelling track, which resembles another one of her tracks "you should see me in a crown" (despite the comparison, the two are extremely different.) Now after I've gotten that out the way, now for a review of the track. When we all fall asleep, where do we go?" What do you want from her? Why don't you run from her? All questions of a tortured, hurt soul as well as a monster. As mentioned before, Billie wrote this as a monster. She was trying to explore what a monster would and how they would feel. In a sense, those lyrics reflect that point. She ends off this portion with a lyric that resembles the title of her new album, "when we all fall asleep, where do we go?" Afterwards, we are met with another line by Crooks, "Come here". We then cut again to the bass-filled beat where Billie starts here first verse and continues to ask questions. The verse seems to stray away from the topic of horror, but still keeps the same tone. It seems that she is asking her lover is she good enough for him. She also seems to be bragging about draining him financially and energetically. She ends her first verse with a comparison of how she's "draining you down" like she wants to drown because she just wants to end her. noises that are usually put in movies such as the Conjuring and Poltergeist right before a jumpscare. "Keep you in the dark, what had you expected? But we knew right from the start that you'd fall apart"
The second bar is what really makes me believe this. She was fooled that the label would make her a star and get her connected (possibly with bigger artist, people, businesses, etc.) She was left in the dark because the label didn't tell her anything. They knew right from the start that she'd fall apart. She has expressed these feelings before in an interview with Vanity Fair, saying that celebrities and artist are sad people, her included. She seemed somewhat sadder than before in the interview as well. But then again, this could be a message to her lover. Later in the verse, she claims that she is too expensive for her lover to maintain. We are meet with a quick bridge before the final chorus. It seems to go along with the theme of Billie being manipulated and controlled by the label again, saying she has to sell her soul for the debt she owes, and how she isn't in control anymore. This could also mean she is literally her own monster and her uncontrollable side is taking over, which is plausable since she has always said that she is her own worst enemy. After the bridge, we have another refrain, pre-chorus and chorus, but what really catches my eye this time is the pre-chorus. Despite being heard before, a new aspect is added and that's the screechy violin sounds, as well as the silence between every line. It's was a nice touch to nearly ends of the track. As the track fades away we hear these drum noises increasingly getting louder until it comes to halt. It doesn't really have any significance right now, it may during the album, but one thing I noticed about it is if you play the track on repeat, the drums make the track sound as if it never ends. The entire music video is memorable and it deserves to be awarded. It's very unique. The little "Ah" 's during the refrains, it's a perfect touch. The beat is magnificent as always. Billie's ability to move out of her comfort zone so smoothly, she is truly talented. I only have one word to describe this song: Creative. It's moody, gritty track that's get's your blood pumping. The music video reflects that feel as well. The video adds on to the track, with her being treated like a monster and being experimented on. The topic and premise of this track is good, but if it's going to be for a whole album, that's ridiculous. We want music to listen to, not a twisted fairy tale. I could be wrong though. Maybe she's going to execute it well. Looking at the tracklist, it seems like not everything will be a long nightmare. One thing is for sure, this new album could end in one of two way, an entire flop or a masterpiece, and I really hope it's the ladder. Aye! I'm thehatsmol. Most people know me for the currently in progress edit project, ASTROWORLD X and being part of LEAKTH.IS edit collective EDITTH.IS (pretty much BROCKHAMPTON with editors). I am a very active user on this site and like to be involved in most things that happened. You can usually find me in the Edits & Compilation section and on Discord with my editor boys. My favorite artists are XXXTENTACION, Billie Eilish, joji, LiL PEEP, Lil Tracy, Cold Hart, Playboi Carti, Lil Uzi Vert, Higher Brothers & Rich Brian, to name a few. While writing blog articles, I enjoy spreading genres and review and write about different things. My most notable work as an author is my review of "bury a friend" by Billie Eilish, which has amassed over 2k views. Some other articles I've done are reviews on "STOKELEY" by Ski Mask the Slump God, "wish you were gay" by Billie Eilish, "Are You Bored Yet?" by Wallows and Clairo & my "2019 XXL Freshman List Predictions". Keep an eye out whenever I have a new article, it may be on something you never expect!